This week our reading (as posted on the sidebar under the button) was from Mark 12-16. Psalm 37, I Peter 1. Actually, today I am coming from a totally different passage. I have read all of the reading for this week. But as I was praying about what passage/verse that I was to share about... I received word that the video from our Sunday Service was now posted on you -tube. I immediately watched it and wept again. I knew that this was what I was to share with you today. The song that is being sung comes from Revelation 12:11. Our enemy would love for us to continue to be beaten down, trapped, discouraged, defeated, powerless, afraid, guilt-ridden, full of shame, sick, disheartened... unuseful for Kingdom Work. But Praise be to God... By the Blood of the Lamb and by the Word of our Testimony... We can be overcomers. We can be healed. We can be restored. We can be forgiven. Merely a visual of God's healing, redemptive work in the individual lives of this particular body of believers. And already we have received word from many others, who have shared that they could have/should have been up there too. It is almost 10 minutes in length... but I promise you will be blessed as you see real people give real testimony of what our Lord has done in their lives. the years that the locust has eaten..."
Leave a comment and let me know how... (you can comment anonymous if you would like). And of course, if you have a blog - link with us... we would love to visit with you today too. Hi Dee Dee, I too praise God for His redemptive Work,...in my life and in the lives of those I love. I am glad that He paid for our sins, and once-and-for-all,... secured our place in heaven, when we place our trust in Him. I am going to try to participate this week. I love Psalm 37, so I think I will write my post on it. 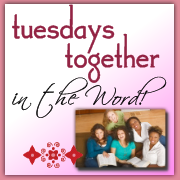 I pray that you will have a wonderful day, and that all of us will be blessed by the posts today on Tuesday's Together In The Word. What a beautiful video. I bet not a dry eye could be found in your church Sunday. So precious! God's redemption is a miracle in each of our lives, from the murderer to the one who uses bad language and all sins in between. he does heal the broken hearted and heal the sick. Our God is an Awesome God!! Our church did that same song for Cardboard testimonies on Easter Sunday. What a beautiful representation it was for Resurrection Sunday for people to show the power of God's sweet redemption in their lives. This song has totally touched me these last couple of weeks and has given me encouragement that He has overcome my current problems. I have been camping on John 16:33 "... In this world you will have trouble. But take heart! I have overcome the world." thank you for posting this. I could have been there with my own cardboard. I'm rejoicing in His redemptive work, too! I love the cardboard testimonies. They truly help people in the real world see what we, in the real world, have overcome and how we have been changed. Awesome post! This is an awesome video. I sooo wish I could have been there!! This is powerful...had tears in my eyes and goose bumps as I watched each brother and sister cross the stage...I don't know if it is because I know them or what...but it is GREAT! I wish Andrea could see this. I am so ready for Heart Friends today! See you there! I love the cardboard testimony ministry and did a post about it once after being inspired from another blogger. I sadly could not pull up the video...something's not working right lately when I try to view videos on some blogs...don't know what the deal is. But, I loved this post sweet friend. We are indeed overcomers because of our amazing Redeemer. I'm so grateful! Thanks for this post. This is so good DeeDee! Every week I say I'm going to participate in this...I love these posts! One question - should I make these a post on my blog in order to join in?? Sorry I didn't make it again - but I sure am blessed by your thoughts! I was blessed AGAIN, and I cried AGAIN! Thank you for sharing this. Now I can show it to hubby. He was at drill and missed this testimony. I almost missed it. So thankful I chose to stay and watch.